I am not one of those women whose weight melts off while breastfeeding. For me, it falls off slowly, very slowly, as perhaps it should. When I nurse, I’m constantly hungry. I try to own it and not fret, but there are moments postpartum when I, admittedly, do not own it very well and want to press fast-forward with weight loss. Six months after I had my third child, I decided to clean up my diet (and hopefully shed a few pounds) doing the Whole 30 program, a strict paleo diet for 30 days. I researched, meal-planned and was prepared. On day five, I experienced the dreaded “carb flu.” It was so profound I thought I was, in fact, sick. I woke up feeling chilled, clammy, feverish and nauseated. Jason was out of town for work and I had to roll out of bed to face the day caring for three children while feeling severely under the weather. The last thing I wanted to eat was a paleo breakfast. I needed something starchy. Not a donut, per se, but not a fried egg with a side of sausage either. 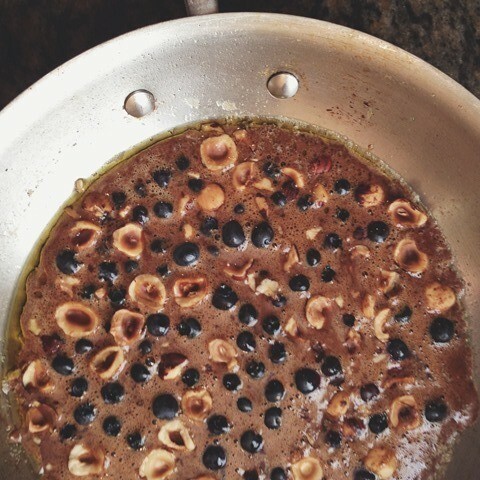 In my carb flu fog, I recalled a recipe I stumbled upon in my Whole 30 research that sounded good: a sweet omelet of sorts with cinnamon, blueberries and hazelnuts. To my carb-deprived palate it tasted like a pastry. I ate two. In the interest of full disclosure, I’m no poster child for the Whole 30 program. I did the diet for 14 days before reintroducing non-paleo foods. The five pounds I lost I quickly regained (the story of any short-lived effort, right? ), and I didn’t lose all of the baby weight until a year after having Maxwell and I had ceased nursing. So, I’m not here to offer an authentic review of Whole 30 but to share a recipe that could perhaps save the day if you reach a breaking point on the Whole 30 or simply want to mix up your morning routine. I don’t eat a strictly paleo diet today, but this breakfast has remained a favorite. It’s an interesting mix of ingredients (although not if you consider that many desserts use eggs as a base), but it certainly feels like a cheat and not in a way that a contraband almond-flour-laden muffin feels on the diet. When we have company, I discreetly prepare it for myself, but almost every time, a guest asks what I’m making and I sheepishly explain, thinking the combination will be off-putting. Everyone who’s tried the omelet has loved it. My mother-in-law often requests it when she comes to town. I happened to have hazelnuts in-house when I first made the recipe but have since switched to making the omelet with toasted almonds because they’re a consistent pantry staple here. The recipe is paleo and Whole 30 appropriate (if you don’t overdo it on the blueberries), but most importantly, delicious and satisfying. I believe good recipes should stand on their own, outside of diets or trends, and this one is a keeper. Feel free to increase the cinnamon, especially if you're using a mild cinnamon. My favorite cinnnamon is Vietnamese, which is bold but balanced. A splash of vanilla extract also adds a nice dimension of flavor. * Toast raw nuts on a baking sheet in a 350-degree F oven for approximately 8 minutes. Melt the butter or heat the oil in a frying pan over medium heat. Meanwhile, in a bowl, whisk the eggs and the cinnamon vigorously until well blended and the eggs have a near liquid consistency when you lift the whisk up from the bowl. Add the egg mixture to the pan. Drop the blueberries and nuts evenly on top. Cook for approximately 4 minutes or until the edges start to firm up and the middle looks nearly cooked. Carefully flip the omelet over with a spatula and cook for an additional minute. If the omelet doesn't flip over in one piece, turn the individual omelet pieces over to cook on the other side. Results will be the same. Enjoy immediately.